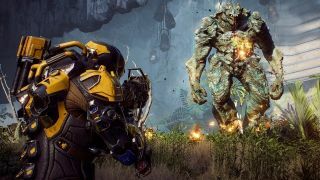 "Our upcoming games will be different from Anthem"
On the heels of BioWare community manager Jesse Anderson's lengthy message to Anthem's frustrated community, today BioWare general manager Casey Hudson published a blog post addressing Anthem's disappointing launch and unclear future. Hudson acknowledged that "there is skepticism out there," but assured players that "there’s a lot more work that we intend to do." "On the one hand it’s been a rougher launch than expected," Hudson wrote. "But then as I think back we also knew that big new online games tend to hit some kind of problem once they go live, so as much as we tested and prepared to make sure everything was ready, we were also ready for the possibility that unexpected issues might arise at launch … We launched a game that so many of you tell us is really fun at its core, but we also had a degree of issues that did not reveal themselves until we were operating at the scale of millions of players. We were of course very disappointed about that, as were many of you." In the past few weeks, Anthem players found evidence that, due to the way Javelin gear is factored into the game's damage calculations, it's often more effective to remove components and other equipment, which put a serious damper on the aspirational side of endgame progression. Not only that, due to a scaling issue, the level one starter guns were found to be more effective than top-tier Masterwork and Legendary weapons. That's to say nothing of the many issues with Anthem's loot system which prompted some players to boycott the game for a full week. Fortunately, the loot system was dramatically improved in a recent update which made higher difficulty activities reward more and better items, but there's still room for improvement. Suffice it to say, Anthem has a long to-fix list. Hudson said Bioware is looking to deliver "more improvements to endgame loot and progression, game flow, and stability and performance" sometime "soon." However, "there's a lot more work that we intend to do," he said. "As we move through this most difficult period of launching a new game and IP, we are also working on the things that will really show what Anthem is capable of - a series of world events, new story content, and new features, that all build towards the Cataclysm later this spring," Hudson said. "But we understand there is skepticism out there. We hear the criticisms and doubts. But we’ll keep going anyway, working hard every day on Anthem - an ever-changing world, constantly improving and growing, and supported well into the future by our team of passionate developers." Hudson also said that while creating Anthem was a huge change for BioWare, a studio known for its single-player RPGs, "our upcoming games will be different from Anthem," just in case you were worried BioWare has pivoted exclusively to live multiplayer experiences. So if nothing else, we can probably expect a more conventionally BioWare experience from Dragon Age 4. Here are 11 Anthem problems we'd love to see fixed.